Panasonic is a recognized award winner in office automation! With a 120 sheet ADF, a 43 ppm Scan Speed, 600 dpi Resolution, Duplex Scanning, TWAIN Compatibility and high-reliability paper handling, the Panasonic KV-S2048C brings true efficiency to your document management!! Scanning Face (ADF): Duplex Scanning via 120 Sheet ADF Up to 17.0 lbs. 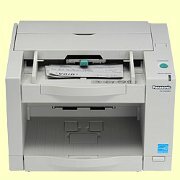 Scanning Size: 8.5" x 25.0"
Document Size: ADF: 2.0" x 2.8" to 8.5: x 25.0"
Paper Weights: 10.7 to 33.9 lbs.